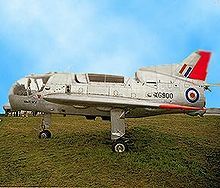 The Short SC.1 was the first British fixed-wing vertical take-off and landing (VTOL) aircraft. The SC.1 was designed to study the problems with VTOL flight and the transition to and from forward flight. The SC.1 was designed to meet a Ministry of Supply (MoS) request for tender (ER.143T) for a vertical take-off research aircraft issued in September 1953. The design was accepted by the ministry and a contract was placed for two aircraft (XG900 and XG905) to meet Specification ER.143D dated 15 October 1954. The SC.1 was a single-seat, low wing, tailless delta wing aircraft of approximately 8,000 lb all-up weight (max. 7,700 lb for vertical flight). It was powered by four vertically-mounted, lightweight Rolls-Royce RB108 lift engines providing a total vertical thrust of 8,600 lb and one RB.108 cruise engine in the rear to provide thrust for forward flight. The lift engines were mounted vertically in side-by-side pairs in a central bay so that their resultant thrust line passed close to the centre of gravity of the aircraft. These pairs of engines could be swivelled about transverse axes; they were therefore able to produce vectored thrust for acceleration/deceleration along the aircraft's longitudinal axis. Bleeds from the four lift engines (using approximately 10% of the intake air mass/thrust) powered variable nose, tail and wing tip jets providing pitch, roll and yaw control at low speeds, when there was insufficient airflow over the control surfaces for conventional control. Fuel tanks were located along the wing leading edges and in "bag" tanks fitted between the main wing spars. Picture - XG900 Short SC.1 at the SBAC show in 1961, showing the oleo leg fairings and the lift engine automatic inlet louvres added in mid-1960. Modes 1 and 2 were selected on the ground; whenever the autostabilizer was in use, the pilot had an emergency override lever available with which to revert to direct control mode in flight. The outputs from the three control systems were compared and a "majority rule" enforced, ensuring that a failure in a single system was overridden by the other two (presumably correct) systems. Any failure in a "fly-by-wire" pathway was indicated to the pilot as a warning, which he could either choose to ignore or respond to by switching to direct (manual) control. In common with other VTOL aircraft, the Short SC.1 suffered from vertical thrust loss due to the ground effect. Research into this on scale models suggested that for the SC.1 these losses would be between 15% and 20% at undercarriage height.. Fixed undercarriage legs were designed specifically for vertical flight with each leg carrying a pair of castoring wheels (the rear undercarriage was also fitted with disc brakes). Long-stroke oleos were used to cushion vertical landings. The robust gear was able to withstand a descent rate of 18 ft (5.5m) per second. Constructed at Short's Belfast factory in Northern Ireland, the SC.1 first undertook initial engine runs at this facility. After being transported by sea to England, the prototype (fitted only with the propulsion engine) was delivered to the Royal Aircraft Establishment at Boscombe Down. The first conventional takeoff and landing (CTOL) flight was made on 2 April 1957. Just over a year later the second prototype made the first tethered vertical flight was made on 26 May 1958, followed on 25 October of that year by the first free vertical flight. The first in-flight transition was made on 6 April 1960. The SC.1 was shown at the Farnborough Airshow in 1960 and the Paris Air Show in 1961. Due to a malfunction of the controls, the second test aircraft crashed in Belfast on 2 October 1963, killing the pilot, J.R. Green. The aircraft itself was rebuilt for further testing. The SC.1 flew for over ten years, providing a great deal of data that influenced later design concepts such as the "puffer jet" controls on the Hawker Siddeley P.1127, the precursor of the Hawker Siddeley Harrier. The work relating to vertical takeoff and landing techniques was also invaluable. Illingworth J. K. B. and Chinn H.W. Variable Stability and Control Tests on the S.C.1 Aircraft in Jet-Borne Flight, with Particular Reference to Desirable VTOL Flying Qualities (R & M No, 3584). London: HMSO, 1969. Retrieved: 11 December 2007. Jones, Barry. "Shorts' Early Risers". Aeroplane Monthly, May 1994, Vol 22 No 5, Issue No 253. London:IPC Magazines. pp.12-19. Lean D. and Chinn H.W. Review of General Operating Experience with a Jet-Lift VTOL Research Aircraft (Short S.C.l.) (Aeronautical Research Council Current Papers CP No. 832). London: HMSO, 1965. Retrieved: 2 December 2008. Taylor, John W. R. Jane's All The World's Aircraft 1966-67. London:Sampson Low, Marston & Company, 1966. Vickery, Adrian. British Jet Aircraft. Cambridge, UK:Patrick Stevens Limited,1982. ISBN 0-85059-589-4.